In Gandhiji's concept of society, youth would be working right from his/her days of schooling. He was a votary of productive work at school. In fact, his philosophy was 'Nit Nai Talim' and the method was 'learning by doing'. Gandhiji was certain that no person who wanted to work could remain unemployed. The system of education that was introduced by British in India was with the twin purpose of turning out clerks for their administration and intellectuals who could think the British way. The first purpose was utterly selfish to get cheap labour and the second purpose was born out of arrogance about the superiority of their modern civilisation. Gandhiji opposed both. Has Gandhiji's criticism of modern civilisation not come true today? Even grudgingly one has to agree. The run is for money. Nobody wants to live in villages and undertake farming land, animals, forests and fisheries. All that youth want after some so-called education is jobs in some service. Do we understand that all production that we require to sustain our body i.e. roti, kapda and makan will be machine produced and in huge scale? The votaries of ever-growing science and technology would claim that new inventions and innovations will change the production method of material goods and humanity will be able to produce every need at home or habitation. 3D printing is often quoted for it. But have we stopped and asked where is the skill and with whom it is? While we should welcome all science and technology, as it has strengthened the sustainable survival of human species on this universe, it is absolutely necessary to put the question that Gandhiji put. Science and technology for what and for whom? Gandhiji had visualised and emphasised that urban civilisation was unsustainable mainly because it was highly resource intensive. He could not then anticipate the impact of human footprint on environment and ecology. But he had directed us toward simple village life with limited wants for physical survival. And he had said that all science and technology should be for decentralised economy where dignity of human labour is retained as being of paramount value. Gandhiji was for rural and decentralised economy. Even today there is huge amount of work that is, employment for all in rural areas. For that the dream has to change. 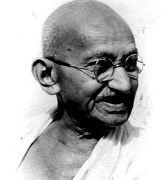 In Gandhi's world minimum and sustainable livelihoods are there for all and it can only support simple life styles and not the one that he had depicted in Hind Swaraj so vividly. The youth of India today can pay rich tribute to Gandhiji on his 150th birth anniversary by upholding his values of dignity of labour and his plan of building a rural-urban or urban society that would have all the science and technology helping to remove drudgery from lives, help provide physical, social and communication infrastructure, and support the use of hands for production of basic minimum needs.